Volunteers from PepsiCo Pakistan took part in organizing a cheerful and bright evening at the SOS children’s village in Lahore as a part of its Lighting Up Lives CSR campaign. 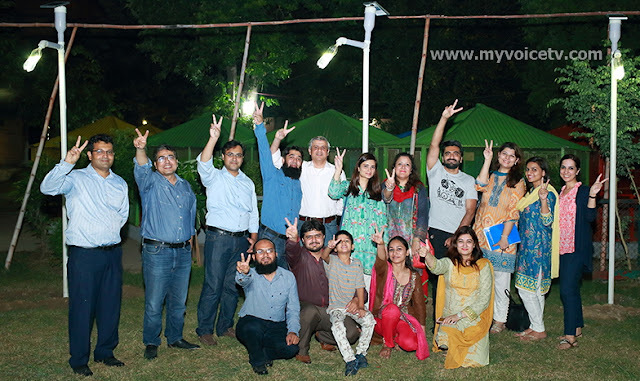 final-pic-pepsico-pakistan-brightens-up-sos-children-village-lhr The campaign aims to bring the ‘gift of light’ through solar powered LED lamps installed in Pepsi bottles to communities in need across Pakistan. The event comprised of activities that volunteers organized and held for the children at the village including an art competition with 70 resident children taking part. The competition was held to encourage creativity and appreciate the children’s artistic skills. The children created fascinating sculptures using bottles, and the top three submissions were awarded prizes.The event was attended by senior management of PepsiCo, senior management of the SOS Children’s Village Foundation and the volunteer team for the Lighting up Lives campaign. Mr. Khurram Shah, Head Corporate Affairs of PepsiCo, while commending the children and their enthusiasm and high spirits, stated that that such corporate social responsibility initiatives from the corporate sector are essential as a means to give back to the community. The President of SOS Children’s Villages Pakistan, Ms. Souriya Anwar, thanked PepsiCo for their collaboration in this event and for choosing the SOS village for their Light up Lives campaign.